The system integrates job identification, training development and performance appraisal under a single system to support competency assessment and mapping of training and career development road map for employees. The system is designed to assist the HR manager in identifying training needs of employees and monitoring their performance against agreed targets. 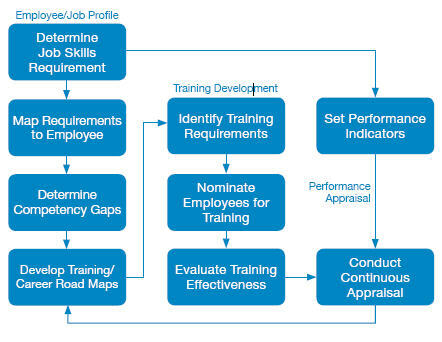 Employee’s training needs are derived based on the differences between competencies required for the job and the employee’s current skill level. The template for employee’s performance appraisal will be based on a pre-defined combination of Key Performance Indicators, Key Results Expected and/or Performance Factors to derive a balanced scorecard for the employee. Fee excludes computer and network hardware, third party software, licenses, service providers’ fees and customisation. For the web version hosted by cxSurbana, there will be an annual recurring fee (includes GST) of S$214 for the 1st 50 users and S$53.50 for each subsequent user. Prior to applying for the grant, companies must be prepared to assign at least one staff who is currently handling HR functions to attend PREPARE™ and commit to the implementation of Re-Employment practices and an e-appraisal system within 2 months of attending the programme. Eligible companies will need to submit an application form to ASME. Upon being accepted into the programme, companies will enjoy approximately 80% subsidy on the S$1,250 programme fee and pay a subsidised fee of S$260 (excluding prevailing GST of S$87.50) to attend PREPARE. Implementation of e-performance appraisal system. An organisational audit will be conducted within 2 months on completion of PREPARETM by ASME on companies. Companies that are able to show documentary evidence in the implementation of a system comprising of the deliverables will receive the grant of S$10,000; S$6,000 for the developed e-appraisal system and S$4,000 in cash to defray efforts in preparing for Re-Employment.